When researching the history of millinery, it is seen in books and films that people have been wearing some version of headwear since the first cave dwellers wear pelts. Because we have no record of the early times, we can only speculate that the reason for the invention of the hat would have been to keep warm. In latter years it is recorded as an indication of status, and thrown into the analysis, hats were, and still are, worn as an adornment or to make one more attractive. Ever since, the hat has reflected not only the mood of its wearer, but the spirit of the time. Hats were the crowning glory, the pinnacle, the grand finale of an outfit. Stories of the history of millinery from Ancient Egyptian, Ancient Greek and ancient Roman through to the present time are told depicting the fashion of its time, and in most cases some type of head dress was included. Hairstyles of the time determined the interesting interpretations of the head wear that was worn with each of the evolving fashion changes. When hairdos were large, hats became either large enough to envelop the hair, or small enough to perch pertly on top. The Art Deco cloche worn in the 1920's called for a smart short geometric hairstyle. History and Lifestyles had a huge impact on what was being worn on the head. Therefore, to give a true representation of the changing fashions, I need to include the hairstyles of that particular time. The term "millinery" was not known until the fifteenth and sixteenth centuries when fine felt, fabric and straw hats were made in the Duchy of Milan and were known as 'Millayne bonnets'. This is where the modern English word 'Milliner' comes from, as the London maker of these feminine caps and bonnets was called a 'millianer'. The Anglo-Saxon word for hat, Haet or haett appears to have signified the shape resembling the petasus; meaning, with crown, wide brim and easily removed from the head. Until the sixteenth century, any hat other than the ‘hood’ was a ‘cap’ in English, or a ‘bonnet’ in French. Only the Scotsman calls his cap a bonnet today. Headwear does not always consist of a crown and brim. In the second half of the fifteenth century, the history of millinery shows that feathers appeared for the first time as an ornament on European headgear. At first a single, long, upstanding feather secured in a golden socket or held by a jeweled medal. Feathers were costly and by the end of the fifteenth century, the fashion had assumed the proportion of the craze. The plumage of rare Oriental birds were imported and ostrich and peacock were considered very elegant. The Ancient Greeks and Ancient Romans included metallic headdresses and also ribbon entwined in elaborate coiffures, so over the centuries, it is apparent that there has not been much in the line of head wear that hasn't already been fashionable at some stage. As you work through the centuries of the history of millinery, many different hat styles appear, and in many cases the places in which they originated, or prominent people, such as kings and noblemen started trends, thus the introduction of named styles such as the 'Homburg' or the 'Monte Cristi'. The large felt cocked hat worn be Colonel Theodore Roosevelt's troop of Rough Riders was named the 'rough rider' hat, and the 'Buffalo Bill' was named after the famous American guide, scout and showman William J Cody (1846-1917) who was always photographed wearing the wide-brimmed hat. The Top Hat and Bowler are two hat styles that have survived many years of fashion. The earliest recording of a version of the Top Hat was referred to as a "Cockade" or "Cocked Hat" and originated from France in the late 1700's. These were felted from Beaver fur and were also labeled "Beavers". The silk collapsible version of the Top Hat, called the "Gibus", named after its French inventor, was designed to be carried under the arm and was the outcome of the tall hat being worn to the opera and occupying too much space in the cloak room. Thus, it was also called the "Opera Hat". The Top Hat, at this time, was predominantly worn by men, however, similar styles for women appeared adorned with decorative buckles and later as riding hats with floating veils. As you can see, different hats style can be labeled with many different names and as we wade through the many years of millinery fashion the same hat style is called something quite different 20 years later. The hat of today is really not much different to that of the 1700's whereby it consists of a brim and/or crown. 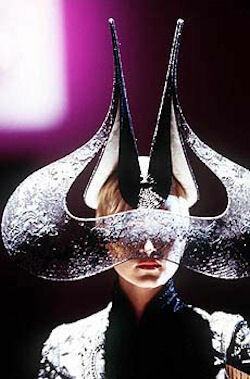 Some of the materials used today are different to those used in the past, which gives the difference in appearance, however, today's milliners are prepared to take the craft that much further, and one Milliner, Phillip Treacy, who works out of London, leads the way with his innovative creations. Here is some of his work. As I add to the History of Millinery, you will find links to the many eras of fashion and the head dress styles of that time. I believe that in learning how to make a hat, one needs to be familiar with its history and appreciate the evolution of the techniques used throughout the centuries. While not much has been written in the history of millinery about the actual production of the hats of the past, it is very interesting to me to speculate what equipment and techniques would have been used.